The World Cup had its first cooling breaks of the tournament during the last-16 match between Netherlands and Mexico in Fortaleza. It took place in both halves when referee Pedro Proenca signalled a three-minute time-out as temperatures reached above 32C inside the stadium. 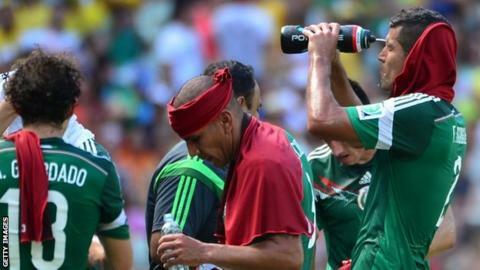 Both set of players rehydrated with drinks, while both coaches took the opportunity to give team-talks. The heat forced fans to move to the back of the stadium to get shelter. Fifa said in a statement: "Climate conditions will be evaluated and should the temperature exceed 32 degrees, then the Fifa venue medical office will recommend cooling breaks to the Fifa general coordinator and match commissioner. "Cooling breaks last three minutes in duration are then implemented by the referee at approximately 30 minutes into the run-of-play in both halves of the match (i.e. around the 30th minute and 75th minute respectively). "Three minutes will then be added to stoppage time at the end of each half."